Noel Godfrey Chavasse was born, along with his twin brother Christopher, on Sunday 9th of November, at 36 New Inn Hall Street, in Oxford. He was the son of a priest, in a family of seven children, and from 1887 to 1900, until his father was made Bishop of Liverpool, he and his twin brother Christopher were both pupils of Magdalen College School (MCS), in Oxford. Both Chavasses made their greatest impact on the sports field and on the river, both boys being very keen at rowing. 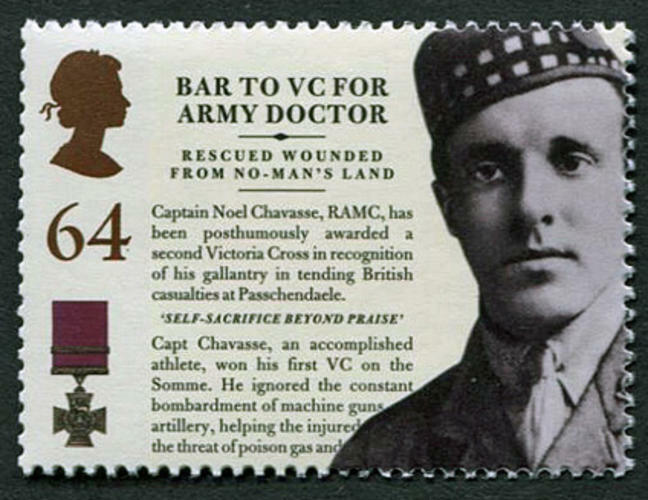 Indeed, Noel Chavasse, whist not quite being the all-rounder that his brother proved, managed to set a new long jump record of 15' 2" in the 1899 Sports Day, and in both 1897 and 1898 he came in one of the three medal positions in the annual sack race, coming first in the former. He was awarded a full colours tie for his success at rowing. 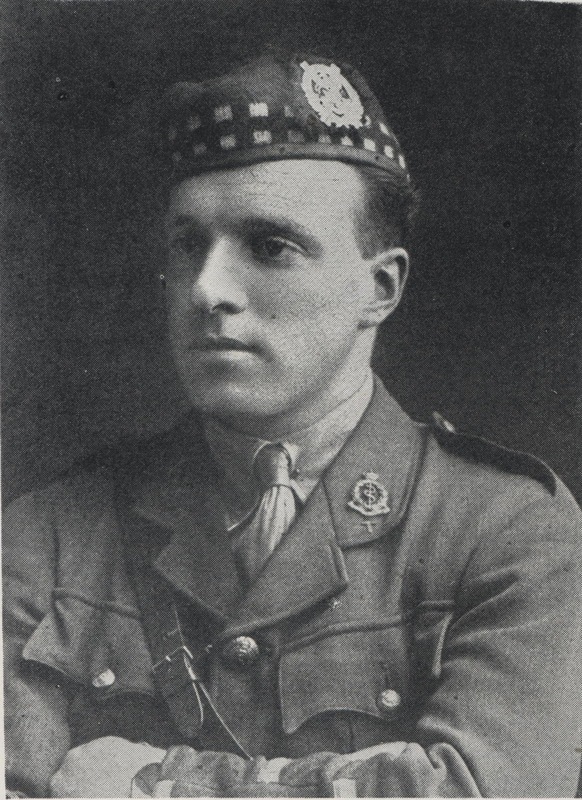 After leaving MCS in 1900, Chavasse remained in contact with his old school through the Old Waynflete's club (the Old Boy's society), and from 1908-12 he and his brother managed to win almost every OW race that the school put on. He was a distinguished university athlete, both at Liverpool University, and from 1904 Trinity college, Oxford, from where he graduated with a 1st in medicine. 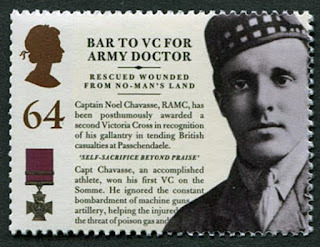 After a brief recovery period at home, Chavasse was back in France, and on 1st August 1917 he was involved in the 3rd Battle of Ypres, where he, with a grave head injury, worked desperately for hours with a captured German medic in appalling conditions to try and save the lives of the many wounded men who were brought to them. Later that day Noel received another wound, and was given a direct order to return to the Allied base, which he ignored, refusing to leave his post. On the 2nd August a shell hit the aid post where Noel was working whilst he was attempting to get some sleep, killing everyone but him, leaving Noel with heavy injuries to his abdomen, which bled profusely. He was stretchered to safety, but died of his wounds in hospital two days later. For his actions in attempting to save the lives of the many wounded and dying soldiers brought to him, he was posthumously awarded a second VC, only the second man in the history of the British Army to be accorded that honour. Although born in Oxford, the city of Liverpool claimed the young surgeon as one of their own, as he had moved to the city in 1900 when his father became the Bishop of Liverpool. 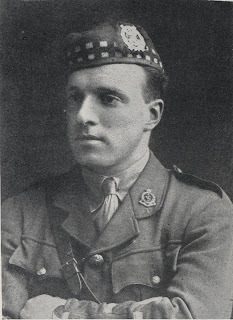 Capt Chavasse had graduated via Oxford and Liverpool Universities as a doctor, becoming an orthopaedic surgeon.at Liverpool Royal Southern Hospital. A Video presented by Lord Ashcroft KCMG PC, this short film marks the centenary of the death of Captain Noel Chavasse VC & Bar MC. Filmed and edited by Julian Simmonds.